Gabriela Rzepecka-Weiß is an author and illustrator of childrens' books. She creates very warm and friendly illustrations with a subtle touch of humor. Her pictures are simple and clear. She is a traveler curious to see the most remote places of the world and a passionate ambassador of Japanese Culture. She is Cambridge Young English Learners Test examiner, and ESL teacher. She created English Garden Program for Japanese children, which she successfully managed for over ten years. She organizes numerous international student exchange trips and events trying to connect children from different cultures. Gabriela is always driven by new ideas and silly images popping into her mind one after another. She is the mother of 14-year-old Kacper (a real dragon with a Japanese soul) and 2-year-old Flora (sweet imp-type) and an absolutely happy wife. The “official” language at Gabriela’s home changes depending on the mood and the people present at any given moment – it is a mix of English, Polish, German and Japanese. If not drawing she likes to spend her free time actively with her family and friends. Do you remember being a little kid and learning about numbers, colors, shapes, sounds and ABCs? 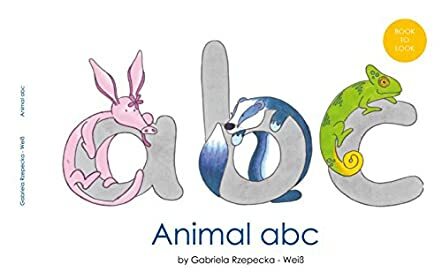 Well Animal ABC by Gabriela Rzepecka-Weiß takes your child back to the basic fundamentals of learning. Animal ABC by Gabriela Rzepecka-Weiß is a beautifully written, colorful, illustrative resource that you can use to teach your child how to read, write, and recognize upper and lower case letters. Additionally, as your child begins to look at each page, they will be able to use visual word and picture recognition to learn their alphabet. Visual recognition is an important element for your child’s cognitive skills. Animal ABC by Gabriela Rzepecka-Weiß will help to get your child excited, not only about learning the alphabet, but reading and becoming familiar with the letters. As the child becomes familiar with the letters, they will then learn the sound that each letter makes to stimulate their reading abilities. As I began looking at each letter, I started to recall how much fun learning was because of exciting and colorful pictures like these in Animal ABC by Gabriela Rzepecka-Weiß. The way the book is set up is simple, which does not complicate the learning process for a child. Simplicity can be extremely helpful to a child. To add a special touch, the parent can either create the sound of the animals or provide an intriguing element about the image representing the letter to make learning more enhanced. If you are looking for an entertaining and engaging children's book, start with Animal ABC by Gabriela Rzepecka-Weiß.